I didn’t get it. Likely a result of my age. But also a result of inexperience. Years later, after a little life experience in my own marriage, I understand exactly what she meant. I firmly believe that a lot of the myths about marriage can lead to big problems. So, let’s debunk some of the myths about marriage and set the record straight. If you thought that the wedding was challenging and marriage was going to be easy, you have it backward. The wedding, despite all of the stress of planning it, is actually the easiest part of the marriage. Marriage is filled with ups and downs, give and takes, and none of it is easy. Does it get easier? Is it worth it? Absolutely! But going into a marriage with the expectation that it will be easy sets you up for disaster. I’m not sure where I first heard this saying, but it’s highly inaccurate in a healthy marriage. (And I find it highly annoying that the emotional well-being of only one partner would be responsible for the health of a partnership.) Marriage should not be one-sided and, if you find that it is, there’s a problem. It also implies that the wife should be placated when her emotions show. Each spouse should be willing and ready to discuss, compromise, and look out for the pleasure of the other. It’s not all about the wife, nor is it all about the husband. It’s about the partnership. Your spouse is your better half. Your spouse won’t complete you. Nor will he fill any holes in your life or gaps in your personal welfare. When you get married, half of you doesn’t disappear. You are a whole person going into a relationship with another whole person – so you should make sure you are working on yourself and not look for your spouse to fix you. Together you are a stronger team, but you are still you. Your spouse should make you want to be a better person – not consume you. The seventh year is the toughest. For some couple, the “seven-year itch” might be a real thing, but for many couples I know, the toughest years are ten and eleven. Any time you or your partner become complacent, it leads to challenges. All marriages are full of seasons, there will be ebb and flow. Marriages that stay together are the couples who share the goal of coming back together when they feel themselves drifting apart – rather than continuing to cruise in opposite directions. You will have to make the choice whether to fight for your marriage or not. You may never have trouble in your seventh year – or 10th and 11th for that matter, but you will go through ups and downs. They are inevitable. Be prepared for them. When you’re in a great marriage, you do everything together all the time. Imagine being around only one other person for the rest of your life without any other friends…forever. Sounds…not so much fun, right? Happy couples know that they occasionally need time away from one another. Some couples need a little time, some need a bit more. Yes, doing things together is vital, but doing everything together is unrealistic. Don’t be afraid to grow and try new things on your own. Having some “me time” does not mean one partner dumps the kids with the other and heads out the door every time the phone rings. You have to be able to talk about what you need and work together to fulfill those needs, even the needs to explore individual interests and nourish friendships. 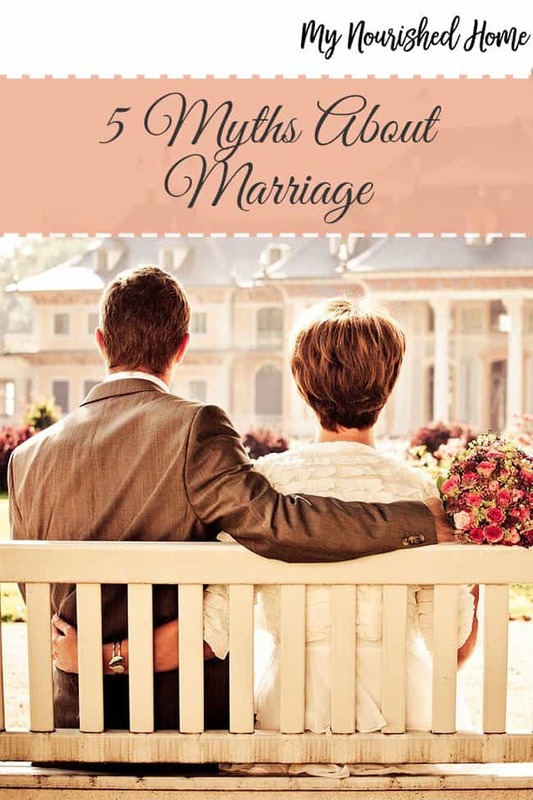 Marriage is not easy and it’s not a one-size fits-all endeavor. Find the things that work best for your marriage and your partner. 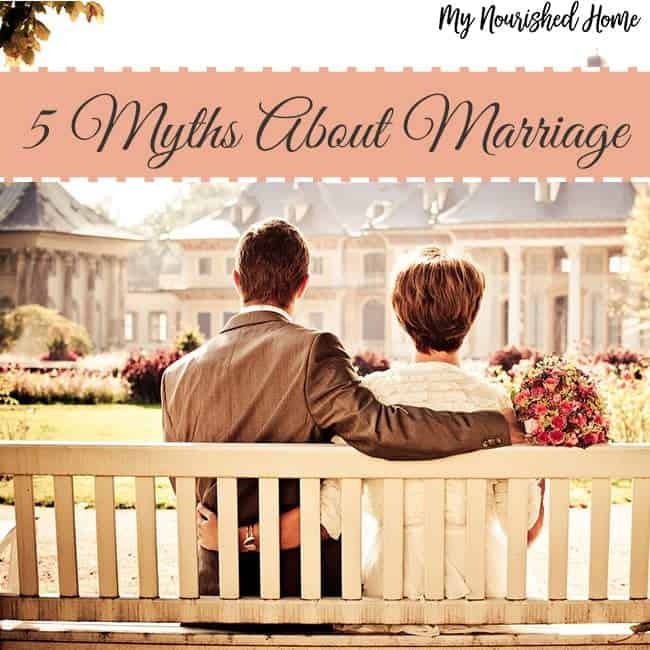 And when you recognize one of these myths about marriage creeping in your thoughts, talk to your spouse about it. When you find your own way and develop behaviors that work best for you, your marriage will be stronger and healthier.